Home > Members > FAQs > How can a member put a delivery hold on their account? How do delivery holds work? If your program allows members to set their subscription on temporary or permanent hold, their are 2 optional settings in the system you can set. 1. Temporary Hold The member can set up to 3 different delivery hold periods in which the system will skip the delivery. The system will automatically set the member on hold and return it to become active when the period ends. 2. Permanent Hold The member can place his subscription on permanent hold. When a subscription is set on permanent hold, the system removes this subscription from deliveries. The member (or admin) can turn off the permanent hold flag to make the subscription active again. Both functionalities can be set from the Member Actions section of the dashboard. B. Members can add up to three delivery holds at a time. C. Changes must be saved. D. Once a member saves their delivery hold, they will see that the date of their next distribution changes to reflect the delivery holds. They will also receive a "Delivery Hold Updated" automatic email. How Can A Member Place a Permanent Hold? If the option to allow a member to place their account on permanent hold is enabled, they can check the box to and their account will be placed on hold. They can remove the hold any time from their account. Once a member saves their permanent hold, they will see there are no future distributions scheduled. They will also receive the "Permanent Hold Change" automatic email. How can I place a member on hold automatically? If your program uses pre-paid per distribution or pre-paid per subscription payment plans, you can request that support enable the feature to automatically place and remove permanent hold statuses based on the member's balance. In farms configured with this feature, the system will run a nighty check for member balances less than or equal to $0 and set them on permanent hold. In the case where the balance is greater than $0 it will remove the permanent hold. How do I communicate the delivery hold feature to my members? Below is some suggested text for explaining how to use the delivery hold feature for your members. Change the text in ﻿red to include your policy link and to insert a picture. We wanted to remind you about our delivery hold feature, which allows you to place up to three delivery holds on your account at a time. This feature gives you the flexibility to pause your subscription during weeks when you will not be able to receive it. For more information on our delivery hold policies, please revisit our Policy page: **INSERT POLICY LINK**. 2. Enter a delivery hold date range. You can select a date range of a single day, or a date range that includes the day / days that you would like to be on hold. 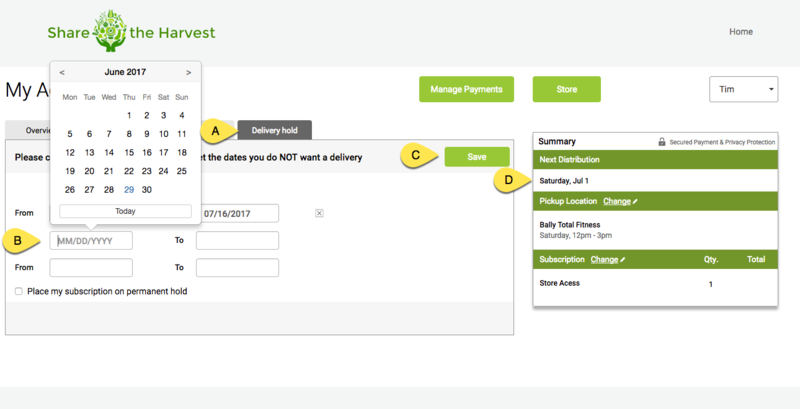 Hit the green "X" button to the right of the delivery hold to remove the hold. 1. 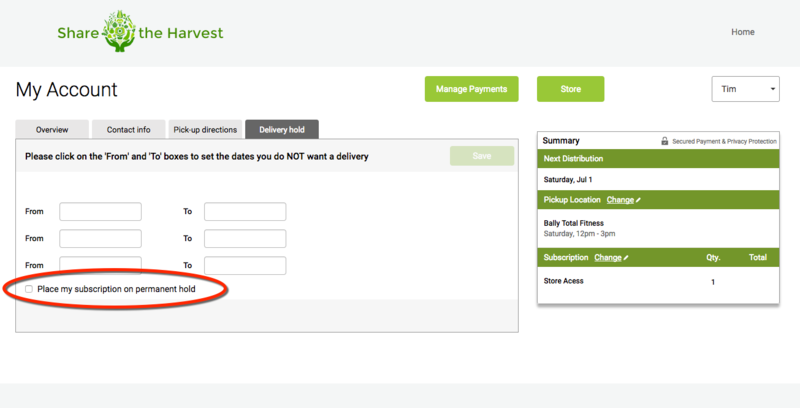 To confirm the date of your next delivery, check the "Next Distribution Date" in the green Summary box in your account and your "Delivery Hold Updated" email. 2. You can add up to 3 delivery holds at a time. If you replace a delivery hold with a different date range, this will remove your original delivery hold.